Installing a sprinkler system will make watering your landscaping a worry-free experience this summer. Here are some tips that you will want to consider as you make plans for your sprinkler system installation. Pay attention to coverage. Make sure there is a little overlap so that every square inch is covered. Select nozzles that are easy to adjust and will last for years to come. 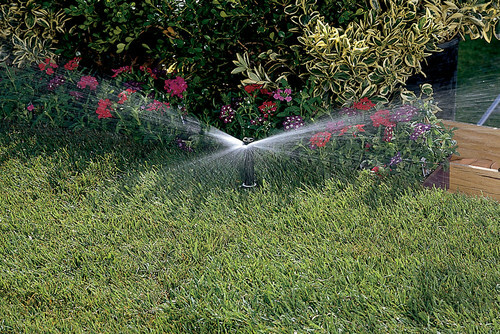 Install the appropriate sprinkler or watering systems for the various landscaping on your property. This will not only save you on your water bills, but it will ensure that your landscaping gets the proper amount of moisture throughout the season. Select a controller that offers controls for multiple irrigation systems and can be programmed easily. Spring for a rain shut-off device. This will allow you to conserve water when it rains, which will help you cut down on irrigation costs. Weatherize your system. Make sure that it is insulated and protected so that it won’t freeze and crack during the winter months when it’s not in use. Do you need help with a sprinkler system installation for a property this summer? Contact the professional commercial install team at Hermes Landscaping, and we can install a sprinkler system as part of your design build landscape.